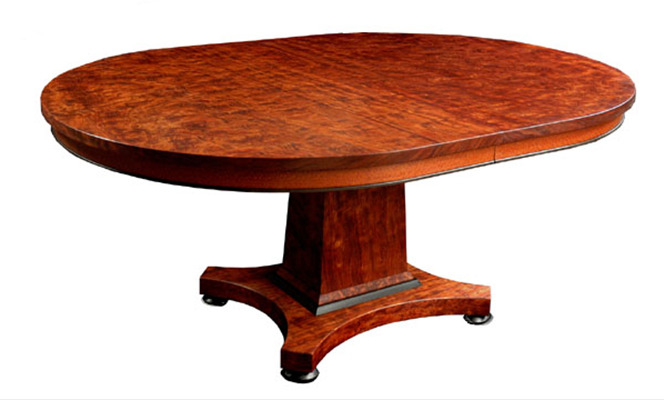 This table was made from one plank of bubinga about 40 Inches wide and 16' long. each of the two halves of the table are a single board, and the leaves are also single board sections ripped from the wider stock. It's got a shimmery, fantastic grain pattern that is extremely difficult (for me) to capture in a photograph. These tables are priced dependent on the cost of the slab, and range in the $900. to $1100. per LINEAL foot of their expanded size. Our Transitional Chairs (item # 172 in the 'seating' section) in bubinga, burl and walnut would look good with this design. 48 x 74 x 29.5 high, closed .... + 3 15" leaves.